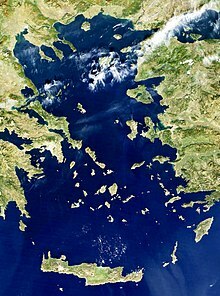 Is í an Mhuir Aeigéach (Tuircis: Ege Deniz, Nua-Ghréigis: Αιγαίο Πέλαγος/Aigaio Pelagos) an chuid den Mheánmuir atá suite idir an Ghréig (an Leithinis Bhalcánach agus an Leithinis Pheilipinéiseach) ó thaobh amháin de, agus an Tuirc (an Mhion-Áise) ón taobh eile de. Is iad Oileán na Créite agus Caolas na Dardainéile teorainneacha na Mara Aeigéiche theas agus thuaidh. An focal Gréigise Αρχιπέλαγος/Arkhipelagos, a chuaigh in úsáid ina lán teangacha sa chiall "oileánra", is seanainm ar an Muir Aeigéach é, agus is é is bunbhrí leis ná "An Phríomh-Fharraige". Tá an Mhuir Aeigéach ag cur thar maoil le hoileáin bheaga, agus mar sin, athrú nádúrtha céille a bhí ann. Chuaigh an HMHS Britannic - comhlong Titanic - go tóin poil ar an 21 Samhain 1916 sa Mhuir Aeigéach. Bhuail sí mianach nó ionsaí toirpéid a bhí i gceist, níl a fhios againn. Tugadh an leathanach seo cothrom le dáta an 21 Samhain 2017 ag 00:43.